Paramount Pictures this week revealed plans to release a DVD box set containing every single episode of Star Trek: The Next Generation. Called the "Borg Megacube", the box set will include all seven seasons of TNG across 48 discs, thus collecting all the individual DVD sets into one package, DVD Answers reported. As the name implies, the set comes in the form of a Borg cube. The Borg Megacube is currently scheduled to hit stores in Region 2 (Europe) on November 3, 2003. It is not known whether a Region 1 (North America) version will also be released, but only 1000 copies will be on sale worldwide. In addition to all 176 episodes of The Next Generation, the package also comes with a limited edition collector's card and a clock featuring the Enterprise-D and a Borg ship. The set carries a recommended retail price of �449.99 in the United Kingdom, but can be pre-ordered from Amazon.co.uk for �338.23, 25% off the RRP. 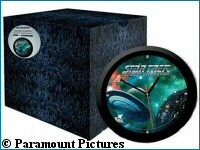 German fans can purchase the Borg Megacube from Amazon.de for EUR 643,99. Check out DVD Answers or Amazon.co.uk for more information. Thanks to Craig for this!